One of the greatest natural wonders happens in the Okavango Delta in Botswana where floodwaters carry over the dry sands of the Kalahari forming an oasis in the desert. Largely ignored in the past by an audience sold on the glamourising of the big game of Africa the flooding of the delta is only now gaining a reputation as one of the earth's great wonders. Despite beautiful and dramatic documentaries and books on the flooding phenomenon the true drama of the happening has to be experienced first-hand to be truly understood as even the most descriptive prose cannot describe the phenomenon that is the annual flooding of the Okavango Delta. Of the many unique features of the annual flood the most intriguing is certainly that the main floodwaters only reach parts of the delta well into the dry season - when the vegetation is drying to dust and many species such as fish are fighting for survival. 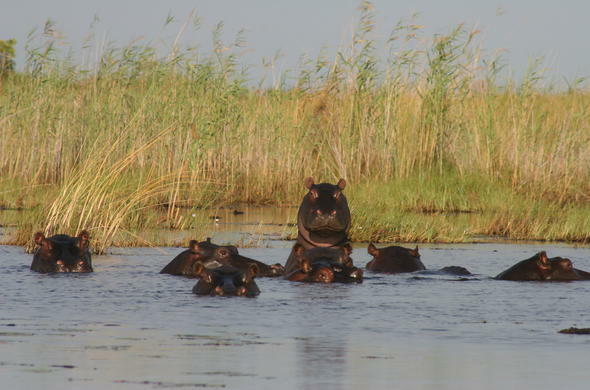 The local rainfall in the Okavango basin generally does not affect the water levels to any great degree. It is said that on average the local rainfall is responsible for 33% of the water in the Okavango system. This is not high enough to flood the dry floodplains. What it does do is raise the water table. In general the local rainfall has little effect on the surface water of the Okavango floodplains but there are years when the delta floods with the rains. Such is the amount of local rainfall that the floodplains become lush waterlogged plains. The water in the delta shows signs of dropping in the latter half of the dry season - from around August - and from then on the drying happens at an alarming rate. With the dry season reaching its extreme during October, also the hottest time of the year in Botswana, the drama's of the wilderness increase in intensity. Fish and crustaceans are trapped in dwindling pools, providing a feast for the predators, and animals such as hippo and crocodiles have to move off in search of permanent water. The start of the rainy season is a temporary respite for the drying will resume once the rains have let up. The drying of the floodplains then continues until the floodwaters from the Angolan Highlands reach the Okavango system. The flood waters move slowly over the dry floodplains and channels, filling pools where fish and crustaceans are fighting for survival. The arrival of the waters provides for a new feast for birds and other animals. As the holes of insects and other small creatures are flooded they will attempt to escape - into the clutches of the waiting predators.